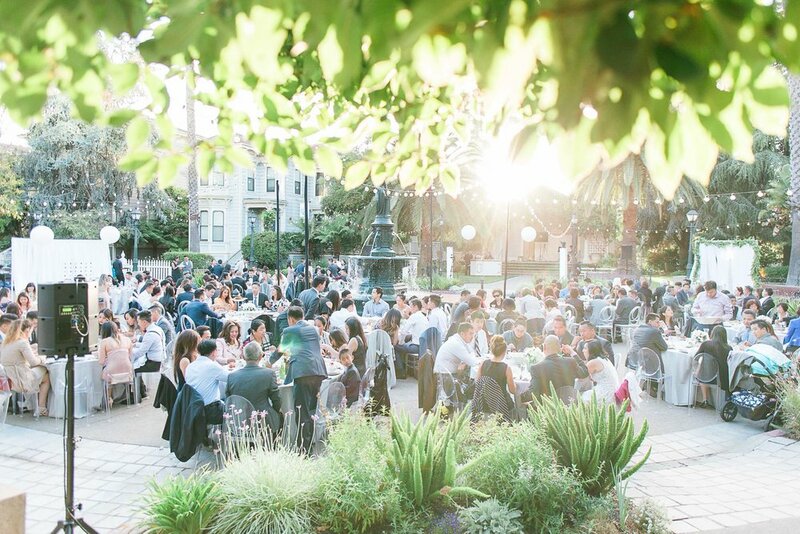 One of our favorite events we coordinated this year was Jessie and Irving’s beautiful wedding reception at the historic Preservation Park in Oakland, California. Working with the couple's all-star team of vendors, we coordinated the set-up and breakdown of the 200+ guest wedding reception. We were so happy to see the Bride shed tears of joy upon seeing the full set-up of the reception (which was all completed within a two-hour window, whew!). As event coordinators, those moments of joy are what we live for! Big shout out to The Social Stylist for all their hard work the day-of with the decor and set-up. We loved the touches of décor the couple chose from the custom acrylic welcome signs and table numbers, to the handmade wooden name cards and donut wall (with none other than Krispy Kreme donuts placed on the wall, yum!). Jessie and Irving are a dynamite couple who are both very humble, professional, and kind. Wishing many blessings to them in their union! Photos by: JBJ Pictures, french wedding and lifestyle photographer based in San Francisco.